Beautiful and romantic. Aspra and rocky. Elegant and worldly. Difficult to find a single adjective that can describe the island of Mykonos, a real summer paradise. A truly beautiful island, which offers its most fascinating and evocative side, during the period of less tourist influx. Far from mass tourism, Mykonos offers truly wonderful views, and typically Cycladic atmospheres. A wonderful landscape, punctuated by the white houses, and the chapels scattered everywhere. Island of entertainment, with clubs and beach bars, ready to entertain until dawn. Perfect place for couples looking for romance. For families, looking for Mykonos beaches, and backdrops to discover. A place to savor excellent Greek cuisine and eat fresh fish every day. A tolerant island, of international level, which will certainly know how to be loved. Whether you are in a family with children, as a couple, or in a group with your friends! A summer Mykonos can only start with the beaches. No matter how beautiful, fascinating and suggestive it may be, the sea is undoubtedly the main reason for choosing Mykonos as a destination for one's holidays. Here are some of the most interesting in detail. Like any self-respecting island, Mykonos is full of incredible bays and inlets that you only have to discover. June and early July are the best time to enjoy, at best, the sea and the beautiful beaches. In July and August, you will have to live with chaos and crowds; not even underestimate the difficulty of parking, in case you have the car. The advice is to arrive early in the morning. Golden beach and a beautiful sea with incredible shades, characterize Superparadise Beach. Set in a narrow bay, surrounded by rocks, it is really beautiful and evocative. Fun, chaotic, tolerant, nonconformist, it is the beach most loved by gays and nudists and, above all, by party lovers. In fact in these parts, in fact, there is the Coco Club, one of the most popular, with an amazing view of the bay. Superparadise is well equipped with deckchairs and umbrellas; You will find a Beach-bar that serves Greek specialties and serves excellent cocktails. 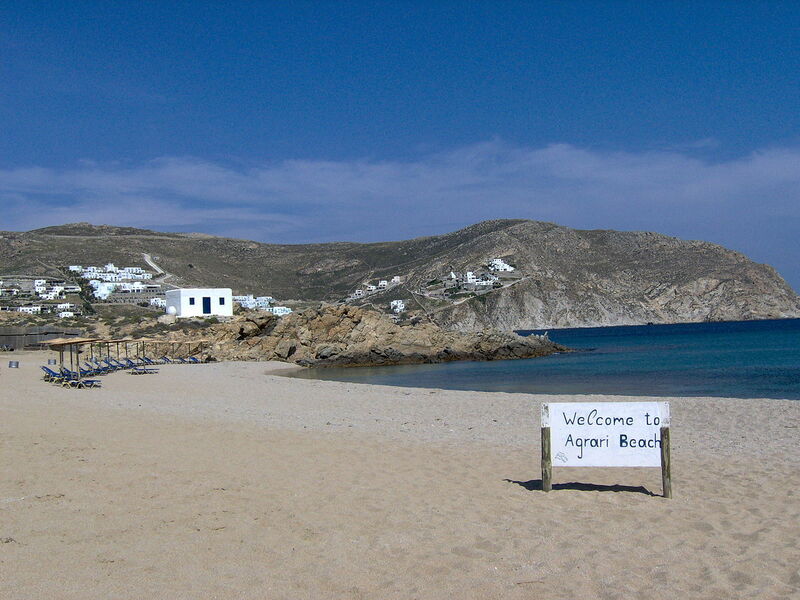 The beach is located along the south coast, distant 6 kilometers from the center of Mykonos. It can be reached by car, following the signs for the picturesque village of Ano Mera; then, continue on a fairly steep road. Alternatively, some boats leave the port of Chora. The longest beach on the island and, for many, the most beautiful. It is located along the southern coast, about 10 km from Chora, and a few km east of Superparadise. Very beautiful sea, emerald color, and golden sand. Elijah is protected by thick vegetation and is not particularly exposed to winds. 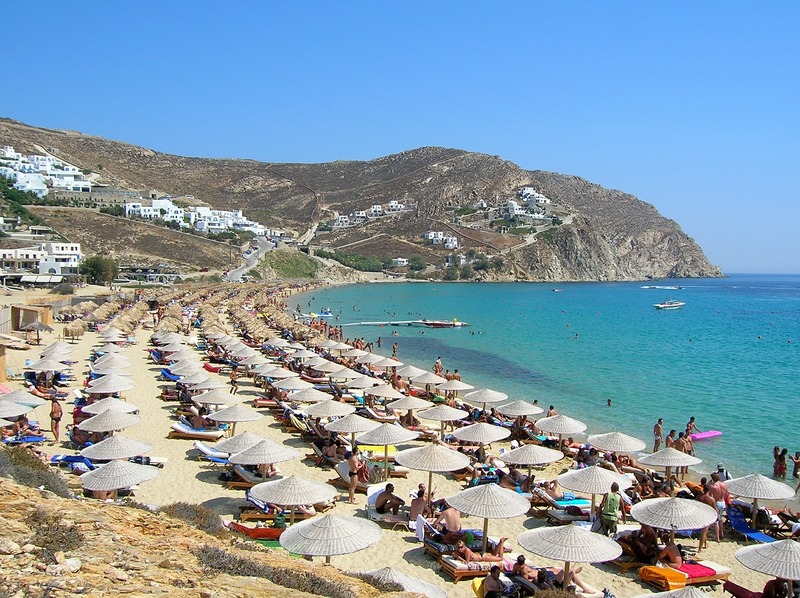 In addition to being one of the most famous beaches of Mykonos, it is particularly popular with gays and nudists who, generally, like to settle on the right side. The beach of Elia is well equipped with sun beds, umbrellas, and equipment for diving and water sports. It can also be reached by bus from Chora. Beautiful, quite quiet and reserved, with really beautiful sand and sea. In our opinion among the Mykonos beaches not to be missed during your holiday. Agrari is located on the southern side of the island, not far from Elia Beach. It is characterized by clear sand and crystalline sea, with shades tending to turquoise. Compared to the nearby, and famous, Elijah, it is quieter and less crowded. Nudism is practiced on this beach. A real paradise. The beach is also well equipped and there is also a center for nautical activities. It is not easy to reach: you arrive, in fact, after a stretch of dirt quite impervious. One of our TOP selections. Not far from the beautiful Elia Beach, this beach will really conquer you thanks to its relative tranquility. Ideal for those wishing to escape from the chaos and the crush of the most renowned spikes. Its long stretch of sand is ideal for walks. The sea is crystal clear. Among the Mykonos beaches, Kalo Livadi is, in a sense, a nice surprise. The only drawback is the meltemi; sometimes it blows really imperious! Crystal clear sea, with shades tending to turquoise, and golden sand, distinguish Psarou. It is a not particularly large beach and therefore extremely chaotic during the summer highlight. Difficult to find free sunbeds in August unless you book. Moreover, it stands out for being one of the few equipped beaches, where you can play water sports. The beach is perfectly accessible by car and scooter and by public transport. From the Chora, every day, the direct bus to Psarou leaves. Also, always from the Chora, a boat is a shuttle between the beach and the port of Mykonos. The beach of Houlakia is located at 5 kilometers north of the Town of Mykonos and is famous for its wild beauty; the beach is rather quiet and private. The beautiful houses behind them give it a very particular and picturesque appearance. Not very well equipped, Houlakia is one of the few Mykonos beaches with pebbles. It is divided into two areas: The left side has a small bay and a small sandy area. The right side is characterized by the strong presence of large pebbles. From here, you can admire beautiful sunsets. More reason to make a jump during your holidays. Maybe in the late afternoon. Among the most popular and crowded Mykonos beaches. It is located just 4 kilometers from the Chora, close to numerous hotels and studios. This makes Platis Gialos the favorite beach for vacationers who prefer not to leave their premises. Fine sand and a sea, emerald shades, really beautiful, characterize this beach is not too long. Keep in mind that, as early as June, the beach is crowded early in the morning. Platy Jalos is perfectly equipped. You will find umbrellas, sunbeds and the possibility to rent jet skis. Paradise Beach is the beach of youth and fun. The place, in fact, is full of bars, restaurants, clubs ... the right place for those who like to listen to loud music, dancing, drinking, partying and being around people. Impossible not to be dragged by the pace of Paradise Beach. In the morning you can enjoy its beautiful and wonderful waters. You will find umbrellas, sunbeds and all water sports equipment. Guests can enjoy fresh cocktails and eat any of the Tropicana's self-service specialties, open all day. In the afternoon and, above all, in the evening, at the renowned Cavo Paradiso, behind the beach, you can let loose and wait for the sunrise !!! Paradise Beach is perfectly accessible, and is also connected by public transport. Frequent, are the bus rides until late at night! Paraga is one of the most beautiful beaches of Mykonos and is located along the southern coast of the island, much loved because it is not super crowded, easy to reach and with one of the most crystalline sea of ​​the island; moreover, you can listen to good music simply lying on your loungers. One of the Mykonos beaches suitable for children, as the sea slopes rather softly: children can play safely on the shore. On the left side of Paraga beach, the smooth rocks form small pools of sea water where you can enjoy the sun. Paraga beach can be reached by car or boat with gulets from Ornos and Platys Gialos. Not far away, there is also the small beach of Agia Anna.